Until recently you couldn't take advantage of Adsense for Domains if you registered a domain name with Fasthosts. However, with the new Fasthosts control panel which now allows you to edit DNS settings, domain name owners can now earn revenue from domain names they don't currently use. If you're familiar with Google Adsense, you may have seen the "Adsense for Domains" link on the "Adsense Setup" tab on the Adsense navigation. Unfortunately the "Quick start guide" Google provides doesn't include instructions for Fasthosts setup and following the generic instructions doesn’t work either. Log-in to your Fasthosts control panel and click on the “DNS” button for the domain you wish to use to park with Adsense for Domains. Points to: your adsense unique identifier e.g pub-xxxxxxxxxxxxxxafd.ghs.google.com. 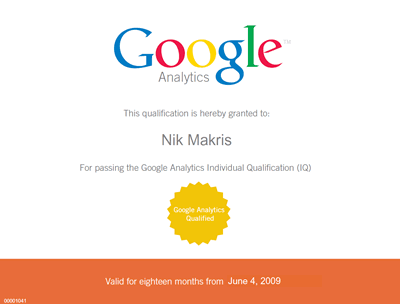 Nik Makris is now Google Analytics Qualified! I just passed the Google Analytics Individual Qualification (IQ) test with a score of 88%! I'm now officially qualified in Google Analytics! If you're interested in taking the test or simply want to learn more about Google Analytics then visit the Conversion University and brush up on your knowledge with the tutorials and presentations before taking the test. I was actually quite surprised how much there is too Google Analytics and how powerful some of the features actually are, even though I've been using Google Analytics for years I learnt some really useful techniques and tricks. The test consists of 70 multiple choice questions and costs $50. You are given 90 minutes to complete the test, and must achieve 75% to pass. You are allowed to pause the test and continue later, but you must complete it within 5 days. The whole test is completed online, and you will receive a PDF of your certificate on completion, which will look like the picture of mine above. The qualification is valid for 18 months. Read more frequently asked questions about the Google Analytics Individual Qualification FAQ. Following on from Google's change of stance, allowing UK and Irish AdWords users to bid on trademarked keywords of other companies, TradeDoubler the affiliate marketing platform has sent its affiliates an email. The email reminds TradeDoubler's affiliates that even though Google now allows its AdWord users to bid on trademarked keywords, it does not mean that any previous keyword bidding restrictions TradeDoubler's merchants had previously with their affiliates are now a free for all. They warn that any affiliate activity that goes against a TradeDoubler merchant's terms and conditions will mean action will be taken such as removal from the programme or network and forfeit of commissions. UK Reg, a domain registrar in the United Kingdom is using text written in one of Google's patent applications to help sell 10 year domain name registrations! I was quite surprised to see a marketing technique used to sell a search engine marketing benefit. "Certain signals may be used to distinguish between illegitimate and legitimate domains. For example, domains can be renewed up to a period of 10 years. Valuable (legitimate) domains are often paid for several years in advance, while doorway (illegitimate) domains rarely are used for more than a year. Therefore, the date when a domain expires in the future can be used as a factor in predicting the legitimacy of a domain and, thus, the documents associated therewith." "Buying or selling links that pass PageRank is in violation of Google's webmaster guidelines and can negatively impact a site's ranking in search results. Not all paid links violate our guidelines. Buying and selling links is a normal part of the economy of the web when done for advertising purposes, and not for manipulation of search results. Links purchased for advertising should be designated as such." Google essentially want websites to designate paid links with rel="nofollow" anchor tags, so link juice or PageRank is not passed on to the website who bought the link. The use of rel="nofollow" anchor tag was originally conceived to stop comment SPAM on blogs and discussion boards, but its use has now spread to the policing of paid links. I understand the difficulties Google and the other search engines must have in determining when to pass link juice between websites, but leaving the webmaster in control of this is like asking Google to start ranking sites by meta keywords again. I'm beginning to believe the future of web search lies in the democratic nature of the StumbleUpon, Digg and other social bookmarking methods like (del.icio.us and my favourite ma.gnolia), whereby users vote, tag and bookmark sites. Surely a combination of popularity and search algorithm is the way forward? Updated: Shortly after I posted this blog entry, Google has been spotted testing Digg-style voting buttons on their results pages! Updated: Matt Cutts and Maile Ohye posted on The Official Google Webmaster Central blog on 1 Dec 2007 a post that intends to clarify Google's stance on paid links. When I read about the new Google Adsense feature "Allowed Sites" a couple of weeks ago, I thought I'd set it up on my account just to make sure no sites were displaying my Adsense code on their own sites, which could end up getting my account banned or flagged as suspicious due to factors outside my control. Let's face it, if they're displaying my Adsense code, they've probably scraped or copied my site content without my consent, so who knows what else they may be up to! There are unauthorized sites that have displayed ads using your AdSense publisher ID within the last week. Please click here to view them. A little intrigued to what these IP addresses were, I decided to investigate further by issuing a trace route command to glean some more information. The trace route results resolved the IP addresses all to Google. I'm guessing that these are in my list because of people viewing my sites in Google's cached pages; So panic over! Would be good if Google could filter out it's own IP addresses from the list though, so I don't have to check out each IP individually. I just finished publishing a post to my blog and noticed this strange Blogger quirk, which seems to have confused the localisation of the page and published some link text in German. Google have added an "Allowed Sites" feature in the Adsense console to stem a problem that has been talked about for a while. Lots publishers have had their site content stolen and re-purposed in an almost identical fashion on another domain, specifically to earn the criminal money from advertising without spending time and effort writing content themselves. In some cases the HTML contained the victim's Adsense code, which when uploaded to a "junk" domain with other duplicate content, essentially associated the original publisher with a bad site in Google's eyes. To protect Google's Adsense publishers from being associated with this crime and having their Adsense accounts potentially banned, Google has developed the "Allowed Sites" feature which allows the Adsense publisher to tell Google which domains it publishes to. As an avid user of Firefox the dangers of using one browser (apart from initial testing) became apparent today, especially considering most web users still use Internet Explorer. The British Pound broke through the physiological barrier of $2 yesterday due to the relative strength of the British economy. For us Brits this has some advantages like cheap shopping trips to New York, and some negatives such as companies who export goods to the US will suffer due to their goods becoming more expensive to American importers. It also affects British web publishers who earn money from American companies. Affiliate programs like Google's Adsense, Amazon Associates etc are all paid in US dollars. Some schemes have the option of holding payments, but with the weakening economy in the US this exchange rate might be with us for some time.